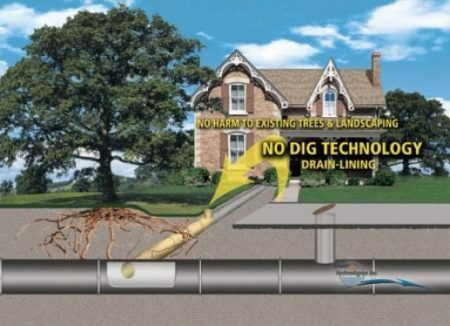 Trenchless Repairs - Sewer Technologies Inc.
Trenchless or No Dig repairs are a less costly and green alternative to traditional dig and replace methods of pipe repair. Without the need for excavation, significant time is saved on digging and restoring trenches since most repairs can be completed within the matter of hours. These processes also save time and costs in in site restoration, disposal storage and the traffic control associated with dig and replace methods. This also means less disruptions to residents and clients. Those who are dependent on the pipes in the repair locations won’t have to relocate or haul water manually for extended periods of time. Cured in Place Pipe (CIPP) Spot Repairs are the practical and economical alternative to traditional sewer replacement. By repairing broken, cracked or damaged sewer pipe, CIPP eliminates infiltration and exfiltration, adding to the structural integrity of the pipe. CIPP lining consists of tube impregnated with polyester or epoxy resin that is used for sectional pipe repairs and can reconstruct pipe diameters of 100mm to 750mm. CIPP Spot repairs have all of the same advantages as full-length CIPP lining at a fraction of the cost. Short sections of one metre or greater can be customized based on the requirements of the repair. Chemical grouting is a low cost alternative to complete rehabilitation of pipelines. It is the best and most economical method for battling infiltration of sewer systems. Sewer Technologies can help eliminate infiltration at joints, laterals, or cracks using chemical grouting procedures. For the repair of joints a “packer” is pulled through the sewer line, stopping at each joint or crack. A pressure test will then be performed. If the pressure test passes the packer will move to the next joint or crack. If it fails the test, Urethane grout will be injected. These chemical grouting processes are televised and recorded by a CCTV camera truck on site. “Before and After” videos are provided on DVD or USB. Laterals When repairing lateral connections a “lateral packer” is winched through the sewer line until the packer is lined up with the infiltrated connection. The end elements on the packer are inflated at the lateral to 35 psi, and then a Urethane grout is injected. The chemical grout forms a watertight, protective gasket on the outside of the pipe, sealing the infiltrated area. 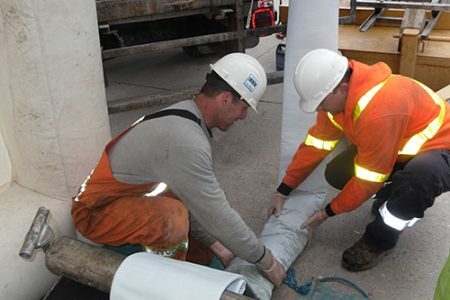 Lateral/Drain Lining is a low-cost relining method for the rehabilitation of lateral connections from buildings to main pipes.Our lateral lining technology uses a PVC-coated polyester needle-felt tube filled with liquid resin. 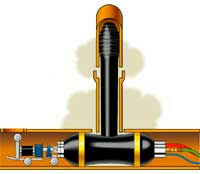 The impregnated felt hose is inverted from a Drum by well proven inversion method using compressed air. The resin filled felt hose is pressed tightly against the host pipe and held until cured. The end result is a solid smooth pipe that acts compositely with the host pipe. Repairs damaged lateral service drains and restores structural capacity of those pipes without excavation or replacement. Reduces potential for accidental damage to other adjacent underground utilities associated with dig and replace methods. Eliminates street excavation, paving repair costs, bonds, traffic control problems and possible accidental excavation damage to other services. Typical lateral re-lining project takes less than 5 hours to complete. Reduces landscape damage and restoration costs. Minimal inconvenience to the property owner during the rehabilitation. Much lower overall costs compared to dig and replace method, especially in congested and hard to access areas, e.g. easements, basements, garden features, etc. Junction Lining is the process of rehabilitating the house connection branch to the main sewer pipe. It seals the point where the house connection meets the sewer main line with the installation of a tubular resin impregnated sleeve affixed to the walls of a lateral pipe (“Lateral section”) at the junction between the pipe and main sewer. In addition the sleeve should seamlessly extend into the main pipe (“the flange section”) thus creating a watertight Tshaped profile. This type of lining is ideal for preventing root intrusion and infiltration. 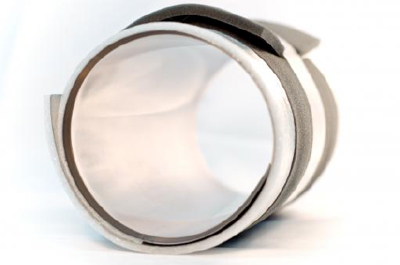 A junction liner can also be used to repair a damaged or broken tee and restore structural integrity. CIPP (Cured-in-Place Pipe) lining is a green process that consists of installing a continuous liner in a pipe from access-point to access-point (typically manhole to manhole). CIPP lining is one of several pipe rehabilitation methods referred to as Trenchless Technologies. It is an approved and preferred method to rehabilitating cracked, broken and failed sanitary or storm sewer pipes. Lining is less expensive and more efficient than traditional open cut replacement methods, normally installed with little or no surface disruption. 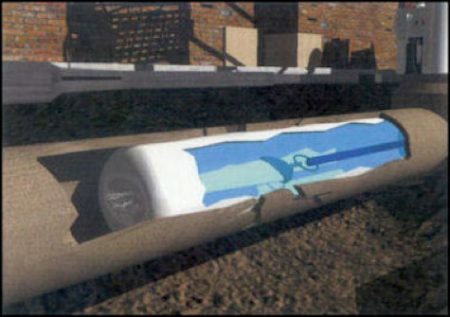 CIPP lining process can be used to rehabilitate virtually any type of pipe. Virtually eliminates infiltration & exfiltration. Mechanical Spot Repairs are an alternative to the dig and replace method of pipe repair. Sewer Technologies is a certified installer of the Link Pipe products. Link Pipe offers stainless steel expandable sleeves used for trenchless structural spot repairs of underground sewer pipes. Link Pipe sleeves are an ideal solution for the repair of cracks, fractures, broken pipes, collapsed pipes, off-set joints, as well as sealing infiltration. 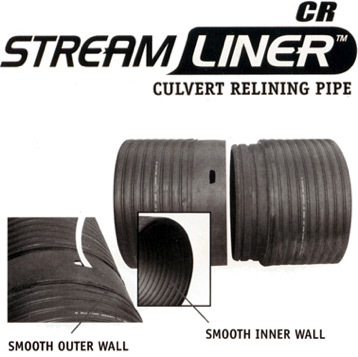 Culvert lining is used to restore structural stability to an existing pipeline. It is an alternative to costly and time-consuming culvert pipe replacement. This method of repair is by installing a smaller, “carrier pipe” into a larger “host pipe”, grouting the annular space between the two pipes, and sealing the ends. Sliplining can be used not only to restore structural integrity of the pipe but also to stop infiltration. The spiral wound high density polyethylene (HDPE) profile pipe has smooth outer and inner walls specifically designed for in-place relining of underground culverts. LINK-PIPE INSTA-LINER™ is made up of short links of stainless steel sleeves, which are coupled together to create a continuous liner of a specified length. Individual links are coupled together and are pulled through the host pipe by a cable from the opening at the far end of the host pipe. 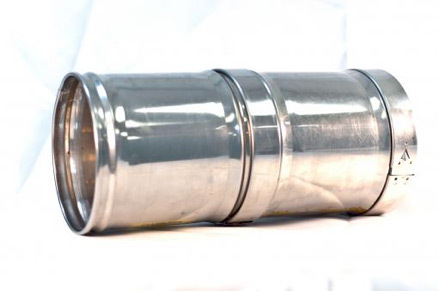 A continuous stainless steel liner is thus formed repairing a damaged, or eroded host pipe and creating a new pipe even where the old pipe is missing. A specially formulated cement grout is then pumped to fill the annular space between the host pipe and the INSTA-LINER™. The grout flows into all cracks and joints, joining together the INSTA-LINER™ and all old pipe sections into a solid and unified structure. LINK-PIPE INSTA-LINER™ can be ordered with a 50-year, 100-year, or any custom designed service life. In all cases, a 10-Year Manufacturer Limited Warranty applies for all materials.